We’d love your help. Let us know what’s wrong with this preview of A Year and Six Seconds by Isabel Gillies. 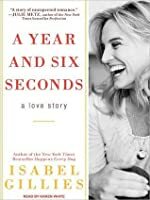 "A Year and Six Seconds" is the true story of "New York Times"-bestselling memoirist Gillies's vibrant yet bumbling efforts to pick herself up after her husband leaves her for another woman--and then of how she stumbles upon true love. To ask other readers questions about A Year and Six Seconds, please sign up. Lynne Lewis I think that the first book is worth reading. 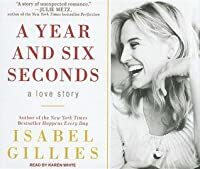 I read Isabel Gillies' first book "Happens Every Day" in 2010; just months before my whole world [like hers in that book] was turned upside down when my then husband, out of the clear blue, walked away from me and my marriage. I know that those first few months after it happened, I thought back to that book and how much grace and willingness to make the abnormal Isabel showed [even amidst the tantrums and anger and crying] to her ex throughout the process and strived to do the same thing [and I I read Isabel Gillies' first book "Happens Every Day" in 2010; just months before my whole world [like hers in that book] was turned upside down when my then husband, out of the clear blue, walked away from me and my marriage. I know that those first few months after it happened, I thought back to that book and how much grace and willingness to make the abnormal Isabel showed [even amidst the tantrums and anger and crying] to her ex throughout the process and strived to do the same thing [and I also remembered how my own Mum was during the process when my father left us and still how much grace she shows that man]; I often failed. When I saw that she had written a second book that focuses on the first year after the separation and divorce, I knew I had to read it. I also knew I had to wait until I was in a better place myself, because I also knew this book was how she fell in love again and I was sure [at the time it was released] that I wasn't ready to read about that [no matter just how happy I was for her]. APPARENTLY, 7 years after my separation and divorce, I was still not ready to read about that. I cried A LOT during this book. A. LOT. And spent some time being envious of her being able to live in NYC [oh how I miss that city] and even though it was tough, had the opportunity to try and heal and move on in one of the greatest cities in the world instead of a dumb little town in the middle of nowhere Pennsylvania where everyone knows everyone and you get tired of people being in your business. But I digress. And I was envious of the fact that she found love again. I think that will never happen for me again. I loved my ex completely and not only am I afraid of never finding that kind of love again, I am TERRIFIED of actually finding it again [you see the dilemma here right?]. It was interesting to see the process for her went and then what she had to deal with AFTER she got remarried and how she did that and became a better person in the process - a better person, mother and yes, wife. When the story opens, it's a dark and slushy winter in New York City, where Isabel is arriving by airplane from Ohio, two toddlers in tow, to move in with her parents; her husband has left her for another woman. In subsequent scene after hilarious scene, Isabel shares her valiant, misguided, and bumbling attempts to understand her own part in the disintegration of her marriage and to feel strong and loveable. And, one by one, she begins to cross items off a staggering single mom to-do list that When the story opens, it's a dark and slushy winter in New York City, where Isabel is arriving by airplane from Ohio, two toddlers in tow, to move in with her parents; her husband has left her for another woman. In subsequent scene after hilarious scene, Isabel shares her valiant, misguided, and bumbling attempts to understand her own part in the disintegration of her marriage and to feel strong and loveable. And, one by one, she begins to cross items off a staggering single mom to-do list that includes: change last name, get bank account, get work, have breakdowns only in front of best friend and not in front of children, find rare preschool slot for son midyear in Manhattan, get along with three generations of family in tight quarters, find a man who can plant one great and romantic kiss, accept self, accept love, be happy. OK, so Isabel Gillies is incredibly self-absorbed and a drama queen. It's not like I didn't know this from reading her first book. I'm not sure why I put this on my to-read list, because not long after I started, I'm thinking, "oh yeah, I really find her annoying, so why did I want to read about how it all worked out great for her?" That feeling persisted throughout the book. She acts like she's the first person to have ever suffered heartbreak, or having her husband fall in love with someone el OK, so Isabel Gillies is incredibly self-absorbed and a drama queen. It's not like I didn't know this from reading her first book. I'm not sure why I put this on my to-read list, because not long after I started, I'm thinking, "oh yeah, I really find her annoying, so why did I want to read about how it all worked out great for her?" That feeling persisted throughout the book. I went into it with minimal expectations - I'm vaguely familiar with her work as an actor, but a friend invited me to an upcoming booktalk and I figured I should at least thumb through this so I was familiar with her work as an author. If I'd started reading this earlier in the day, I would have finished it in one setting. I could not put it down. Her writing is so compelling and this is every woman's story- love, loss and children. The premise is, you may know in six seconds if this is The One - I went into it with minimal expectations - I'm vaguely familiar with her work as an actor, but a friend invited me to an upcoming booktalk and I figured I should at least thumb through this so I was familiar with her work as an author. If I'd started reading this earlier in the day, I would have finished it in one setting. I could not put it down. Her writing is so compelling and this is every woman's story- love, loss and children. The premise is, you may know in six seconds if this is The One -- but that even The One might not be the forever one. She'd relocated do Oberlin, Ohio for her then-husband's job and within a year and a half, he'd left her and their two young boys. This is the story of Gillies' move back to NYC, her childhood bedroom and a mix of the practical (establishing residency to be qualified to take over her parents' lease) to the amusing: hanging a Red Hot CHili Peppers' poster in her former and current bedroom. THe story culminates in her meeting and marrying her second husband, also a divorcé. I listened to the audio version. The author should be lauded for her introspection (which other reviewers have labeled self-absorption) because she was looking within herself to figure out what part she may have played in the dissolution of her marriage. It would have been easier just to say her husband left her for another woman...which he did. But the author also would have led us to believe that she was among the first divorced women in NYC. In this day and age, divorced single moms are not an I listened to the audio version. The author should be lauded for her introspection (which other reviewers have labeled self-absorption) because she was looking within herself to figure out what part she may have played in the dissolution of her marriage. It would have been easier just to say her husband left her for another woman...which he did. But the author also would have led us to believe that she was among the first divorced women in NYC. In this day and age, divorced single moms are not an aberration or a pariah. When her marriage ends, Isabel Gillies finds herself and her two young sons back in New York, living with her parents. Her memoir, A Year and Six Seconds: A Love Story, recounts her struggles to put the pieces of their lives if not back together again, at least together enough to take on a new shape. Gillies’ voice is that of a close friend, and the memoir reads as if the reader and Gillies were catching up over a cup of coffee. The tone is engaging. Memoirs can often read as if the author is dum When her marriage ends, Isabel Gillies finds herself and her two young sons back in New York, living with her parents. Her memoir, A Year and Six Seconds: A Love Story, recounts her struggles to put the pieces of their lives if not back together again, at least together enough to take on a new shape. Gillies’ voice is that of a close friend, and the memoir reads as if the reader and Gillies were catching up over a cup of coffee. The tone is engaging. Memoirs can often read as if the author is dumping all her dirty laundry onto the page for readers to revel in and for the author to take pride in. Although there’s something to be said for the “no shame” approach, Gillies takes a different tack. She retells the initial days of moving back to the family home with the right mix of full disclosure and privacy. She cops to feelings of embarrassment about living with her parents and how it affects their lives, but doesn’t dwell too much on it. This is not a “woe is me” memoir. Gillies never panders to her readers, offering clichéd advice about surviving divorce or jumping into the dating pool again. Instead, Gillies matter-of-factly describes the events of the year after her marriage ended, without excessive hand wringing or wallowing. She doesn’t whitewash events either. She’s the first to admit when she’s incapable of rising above feelings of jealousy, anger and complete sorrow. The emotions of the past are still fresh in her mind, but the perspective of time lets Gillies write about them with a slight sense of distance. What comes through most of all is her love for her two sons. The move from a suburban college town in Ohio to Manhattan couldn’t have been easy for the family. But Gillies and her parents make the most of it for the boys. Whether it’s turning getting dressed in winter gear into a game with waiting chairs or finding the perfect nanny through Craigslist, Gillies writes with honesty about single motherhood. She has a strong support system and acknowledges it as helping get her through the year. Details of the marriage’s end are left to Gillies' previous book, Happens Every Day: An All-True Story. A Year and Six Seconds spends its time looking at how divorcing parents try to remain a family across state lines and how Gillies is able to accept that reconciliation is out of the question and she wouldn’t want it anyway. Gillies gets a second chance at six-second love toward the end of the memoir, about a year chronologically after her first marriage ends. This isn’t a spoiler: Gillies tells readers up front that there’s a second love in her life. But the memoir doesn’t follow Gillies on madcap adventures in dating. She talks about her first post-marriage kiss (a true New York moment) and some of the dates she went on, but they’re not important to who she is now and Gillies rightly leaves details out of the memoir. Some readers may want more from the book in this regard, but the love story of the subtitle is really about Gillies’ love for her sons and (as corny as it can sound) for herself. This memoir is a sequel to "Happens Every Day", in which Isabel Gillies described her (first) marriage to a brilliant but difficult literature professor, their life in the hippie college town of Oberlin, Ohio, and the eventual breakdown of her marriage. That book was very touching, because it alternated the joy of finding love, having babies, creating a new life, with the sudden bewilderment of finding out that your husband just doesn't want to be married to you any more (of course there's anoth This memoir is a sequel to "Happens Every Day", in which Isabel Gillies described her (first) marriage to a brilliant but difficult literature professor, their life in the hippie college town of Oberlin, Ohio, and the eventual breakdown of her marriage. That book was very touching, because it alternated the joy of finding love, having babies, creating a new life, with the sudden bewilderment of finding out that your husband just doesn't want to be married to you any more (of course there's another woman in the offing). This book picks up just when Isabel has returned to New York City with her two small boys. She moves in with her parents in their fancy-but-small Manhattan apartment (with view on Central Park), tries to get on with the daily aspects of parenting (finding a preschool, finding a pediatrician) and in general tries to get on with her life. This includes some tentative dates. Eventually, about one year after her first marriage fell apart, she falls in love with an old acquaintance and they merge their two families. Happily ever after. Without wanting to minimize the heartache and hurt that the author felt, this book came across as "divorce-light". Perhaps it was because she had so many safety nets, compared to other women? The old parental coop to fly back into, loads of caring (and rich) friends to pick up the threads with?Isabel Gillies seems to have fitted right back into her Old Money life in New York, including wearing her friends' designer castoffs to dates. She seems to get a job somewhere, but there is definitely a sense of there being a financial cushion. When her husband flies over to spend the weekend with his sons, she takes off for a spa weekend with her girlfriends - somehow it all came across as too easy, too much like a Hallmark movie. Her children's anxiety and sadness comes through occasionally, but even then it's usually in relationship to her own life. Isabel Gillies believes it takes a full six seconds to fall in love. However, one has to be ready and willing to experience those six seconds. After Gillies’ first marriage ended, it took about a year for her to get to that readiness. Gillies’ 2009 memoir, Happens Every Day, explored her marriage to the father of her two young sons, which abruptly ended with her husband’s announcement that he was leaving her for another woman. This follow-up opens as Gillies brings her children back to her own ch Isabel Gillies believes it takes a full six seconds to fall in love. However, one has to be ready and willing to experience those six seconds. After Gillies’ first marriage ended, it took about a year for her to get to that readiness. Gillies’ 2009 memoir, Happens Every Day, explored her marriage to the father of her two young sons, which abruptly ended with her husband’s announcement that he was leaving her for another woman. This follow-up opens as Gillies brings her children back to her own childhood home - her parents’ New York City apartment - and takes the first shaky steps into a new stage of life as an unmarried woman and single parent. Not all of those steps move her directly forward, as she often finds herself sorting back through her broken marriage to understand how it happened. But as she focuses on creating a secure place for her children to grow, she’s growing too, and coming to understand herself and what she wants in her next relationship. And she does want that next relationship...when it’s time. In this follow-up memoir to “It Happens Every Day”, Isabel Gillies, bares her heart and all the raw emotions that came in the aftermath of her separation from her husband who has fallen in love with someone else. She leaves her home, most of her possessions, most of the possessions of her children, and the Midwestern town she has called home. She is honest with her hurt and pain as she heads back to her parents’ apartment in New York with her two very small little boys. My first thoughts when I began this book was why would she move back in with her parents but once the scene unfolds, you realize that it was the best move she could have made for all of them in terms of a safe, warm, loving cocoon that helped both her and the boys heal. Her frankness about the obstacles, uncertainty, and the depression that comes to her in waves almost every day, is a wonderful gift to other women who may be going through this kind of separation and loss of a relationship and will help them see that they are the only out there with the same or similar problems. This is wonderful personal story that takes you through all the different stages of the failing of a relationship. You wonder at times if Isabel will come out on the other in tack or will she withdraw with the help of her aging parents. Her story is one that can be recommended to a friend who might be going through a separation or divorce, to someone you know who is finding it difficult to move on just yet, or simply anyone who want to see that there is light on the other side of any bad situation. Having read and enjoyed her first book Happens Every Day, I was curious about the rest of the story. What happened after she packs up her two boys, leaves her cheating college professor husband, and moves in with her parents in New York City? Aside from being a giant mess...how does she navigate this next part? As in her first book, author Gillies does not seem to hold back, even when it portrays her in a poor light. I am confused about the purpose of this book - is it supposed to be triumphant, Having read and enjoyed her first book Happens Every Day, I was curious about the rest of the story. What happened after she packs up her two boys, leaves her cheating college professor husband, and moves in with her parents in New York City? Aside from being a giant mess...how does she navigate this next part? As in her first book, author Gillies does not seem to hold back, even when it portrays her in a poor light. Die Autorin ist eine amerikanische Schauspielerin, die von ihrem Mann verlassen wurde und in diesem Buch nun wieder ihr Glück findet. Es ist die Fortsetzung von "Happens every day" und erzählt, wie die Geschichte weiter geht. Sie findet einen neuen Mann, sie heiraten und starten in ein neues Leben. Der Weg dahin, die Scheidung vom Ex-Mann, das Kennenlernen des neuen Mannes und die damit verbundenen Gefühle, auch in Bezug auf die involvierten Kinder, wird erzählt. Nachdem ich das erste Buch quasi Die Autorin ist eine amerikanische Schauspielerin, die von ihrem Mann verlassen wurde und in diesem Buch nun wieder ihr Glück findet. Es ist die Fortsetzung von "Happens every day" und erzählt, wie die Geschichte weiter geht. Sie findet einen neuen Mann, sie heiraten und starten in ein neues Leben. Der Weg dahin, die Scheidung vom Ex-Mann, das Kennenlernen des neuen Mannes und die damit verbundenen Gefühle, auch in Bezug auf die involvierten Kinder, wird erzählt. Nachdem ich das erste Buch quasi verschlungen hatte, habe ich direkt das eBook gekauft und weiter gelesen. Wie schon beim ersten Teil sollte man keine Weltliteratur erwarten. Es ist eher die Schilderung einer guten Freundin über das aktuelle Leben. Die Gefühle, die in einer solchen Situation entstehen, sind sehr treffend beschrieben und sicherlich von jedem Leser nachvollziehbar. Da sie eine neue Liebe findet, sicherlich ein Happy End. Dennoch erwähnt sie, dass das Leben deshalb nicht nur einfach und toll ist. Deshalb, und auch wegen der vielen beschriebenen Gedanken, die sich die Autorin macht, ist das Buch sehr realistisch. ich das Buch gerne gelesen, finde schade, dass es vorbei ist und kann mir gut vorstellen, es einmal wieder zu lesen. Es bleibt meinem eBook-Reader also erhalten. So weit ich weiß, ist das Buch bisher noch nicht auf deutsch erschienen. “A year and six seconds” by Isabel Gillies, follows her life as her husband Josiah leaves her, and she is forced to move from their house in Ohio to live with her parents in their rent-controlled apartment in New York. To complicate matters, Isabel is forced to settle her two toddler sons into their new New York home, adjust to her ex-husband’s betrayal, and attempt to make a new life for herself (get a new state driver’s license, open a bank account, find a job, etc.) in spite of all the obstac “A year and six seconds” by Isabel Gillies, follows her life as her husband Josiah leaves her, and she is forced to move from their house in Ohio to live with her parents in their rent-controlled apartment in New York. To complicate matters, Isabel is forced to settle her two toddler sons into their new New York home, adjust to her ex-husband’s betrayal, and attempt to make a new life for herself (get a new state driver’s license, open a bank account, find a job, etc.) in spite of all the obstacles. Gillies is probably best known for her role in “Law and order.” Although I am not an avid watcher of the show, I became interested in her memoir after reading a blurb about her story. This is definitely not a weepy-divorce type of book. Rather, it an optimistic account of overcoming the pain and discomfort of divorce—only to end up on the sunny side of life. I found the writing candid, humorous, and down to earth. The memoir itself is very reminiscent of a diary, as Gillies reflects upon intimate issues. At one point, she even confesses to feeling unwanted—her ex-husband loves another woman, her mother is tired of seeing the constant ruckus in her apartment that comes from Isabel and her two children, her friends try to unsuccessfully match her up with potential suitors, and life in New York is giving her a hard time. It’s the kind of memoir that is both interesting and highly relatable. This book isn't going to win any awards for brilliant writing but the story develops as though the reader is spending a long weekend with the author and hearing her tell the story of going from despair to to happily ever after. Unlike others who have read this memoir, the author was completely unfamiliar to me because apparently I'm the only person in the world who doesn't watch Law & Order, SVU. Still, every person's experience with the end of a marriage, being tossed aside for another woma This book isn't going to win any awards for brilliant writing but the story develops as though the reader is spending a long weekend with the author and hearing her tell the story of going from despair to to happily ever after. Unlike others who have read this memoir, the author was completely unfamiliar to me because apparently I'm the only person in the world who doesn't watch Law & Order, SVU. Still, every person's experience with the end of a marriage, being tossed aside for another woman and having to find oneself as a single parent is compelling. The author is lucky to have supportive parents with a large apartment in Manhattan who welcome her and her boys. Clearly she doesn't have quite the financial worry many newly single women face and she does have a career to help pay for her son's pricey pre school tuition - among other mandatory Manhatten lifestyle expenses. What I came away with is that she figured out that in order for her children to be as healthy and happy as possible given the circumstances of divorce and parents living in separate states is that she had to make peace with their father and his new wife. Marriages can end but parenting is forever; people who can rise above their anger and put their chidlren's needs first are good role models in my mind. This is a sequel to her first memoir, Happens Every Day, which details her marriage breaking up. Now Isabel is living with her young sons (a four-year-old and a two-year-old) and her parents in their New York apartment. In this book, Isabel talks about how she starts her life again. It helps to know that the story ends well; a few months after moving back to New York, she meets a man and a year after that meeting, they were married. Even so, it's hard to read how Isabel has to adjust to being sin This is a sequel to her first memoir, Happens Every Day, which details her marriage breaking up. Now Isabel is living with her young sons (a four-year-old and a two-year-old) and her parents in their New York apartment. In this book, Isabel talks about how she starts her life again. It helps to know that the story ends well; a few months after moving back to New York, she meets a man and a year after that meeting, they were married. I do like how she doesn't idealize herself. She was angry for a while, she said, and she called the woman that her first husband was in love with, the one that ended their marriage* and there were arguments and bad things said. But even so she's impossible not to root for and I'm glad things worked out. * = although that's a little simplistic; you can't steal someone who doesn't want to be stolen, you know? Circumstances for every divorce are different from each other, and also similar. In this book, Gillies records the year after her divorce, living in NYC with her children, in her parents' home. With humor, and complete honesty, she tells her feelings of failure, her struggle to be a single mom, and the constant panic to somehow make a good life out of this mess. Yes, she has it easier than many single moms. (Her parents take them in, so she doesn't have to worry about financially supporting her l Circumstances for every divorce are different from each other, and also similar. In this book, Gillies records the year after her divorce, living in NYC with her children, in her parents' home. With humor, and complete honesty, she tells her feelings of failure, her struggle to be a single mom, and the constant panic to somehow make a good life out of this mess. Yes, she has it easier than many single moms. (Her parents take them in, so she doesn't have to worry about financially supporting her little family, right away). She acknowledges how fortunate she is to have had that support. She is grateful and knows that other women aren't quite so lucky, post-divorce. I thoroughly enjoyed Gillies' preceding memoir centering on the discovery and infidelity and subsequent unanticipated demise of her marriage, so it comes as no surprise that I found this follow-up equally appealing. She is again refreshingly honest and open about the myriad of emotions, thoughts, and behaviors that can come rushing in during the experiences of navigating a divorce, single parenting, and moving on from a broken heart. It reads as though she is telling us her story over a glass of I thoroughly enjoyed Gillies' preceding memoir centering on the discovery and infidelity and subsequent unanticipated demise of her marriage, so it comes as no surprise that I found this follow-up equally appealing. She is again refreshingly honest and open about the myriad of emotions, thoughts, and behaviors that can come rushing in during the experiences of navigating a divorce, single parenting, and moving on from a broken heart. It reads as though she is telling us her story over a glass of wine and shared friendship. "For a time, you get to drink one more glass of wine than you should and cry at the drop of a hat. You are allowed to feel pitiful and eat junk food, because let's face it, when the ship is going down, why not have an eclair?" "It doesn't go away, the importance you put on one single person, the value that he had for you, the assumption that you would lie beside him forever; the hope that you had for your union is so great that the loss of it doesn't go away." I like happy endings. I also like seeing my feminist values affirmed - for some of us it's career first and then - for some of us - house, home, hubby and kids is where it's at. I was a 60's housework-hater who didn't want my mother's life. Isabel Gillies is a 21st Century mom-at-heart. I enjoyed reading about her struggle to figure out how to make her own values work for her and her kids. And I liked watching her finally deal with the lack of self-awareness so apparent in her first book. Despit I like happy endings. I also like seeing my feminist values affirmed - for some of us it's career first and then - for some of us - house, home, hubby and kids is where it's at. I was a 60's housework-hater who didn't want my mother's life. Isabel Gillies is a 21st Century mom-at-heart. I enjoyed reading about her struggle to figure out how to make her own values work for her and her kids. And I liked watching her finally deal with the lack of self-awareness so apparent in her first book. Despite the truly enviable financial and emotional support, her troubles were real, her kids were shell-shocked, and her self-assurance was rocked. The fidelity of her many girlfriends (and men friends) says a lot about her character, while her navigation of the dating wars demonstrated her good humor and developing common sense. That vignette where she set up FaceTime with the (deplorable) ex, to calm her tantrum-y pre-schooler was quite a contrast to her own post-breakup tantrums. "A Year and Six Seconds" is Isabel Gillies follow-up memoir to "It Happens Everyday". I loved "It Happens Everyday", Gillies first memoir about living in OH. Living what she deems to be the perfect life, Gillies' husband announces one day, seemingly out of nowhere, he is no longer interested in being married to her, packs up and leaves, leaving Gillies with their 2 young sons. Gillies soon finds out he has fallen in love with another woman. "A Year and Six Seconds" goes into what happens when Gi "A Year and Six Seconds" is Isabel Gillies follow-up memoir to "It Happens Everyday". "A Year and Six Seconds" goes into what happens when Gillies and her sons move in with her parents in the very NYC apartment she herself was raised in. Her writing is a candid, honest look at her finding herself. We read along as she picks up the pieces of her broken life. No matter where you are in your life; married, divorced, never married, parent, no children, I guarantee you will nod your head in agreement over many of Gillies' observations of life and relationships. This is the first time I have read a second memoir from the same author, a part two of sorts. I did think about this before deciding to read this book but I enjoyed Isabel Gillies' first book I(Happens Every Day) so much I wanted to give this one a try. I didn't enjoy this book as much as her first one but I think I understand why. This memoir focuses on the first year after a separation/divorce, from having to live with parents to rebuilding a life. These are not experiences I have had to endure This is the first time I have read a second memoir from the same author, a part two of sorts. I did think about this before deciding to read this book but I enjoyed Isabel Gillies' first book I(Happens Every Day) so much I wanted to give this one a try. I didn't enjoy this book as much as her first one but I think I understand why. This memoir focuses on the first year after a separation/divorce, from having to live with parents to rebuilding a life. These are not experiences I have had to endure (and I hope I never will). It's a bit repetitive for my taste. This is a netgalley book and the actual release date is August 2011. A Year and Six Seconds is the continuation of Gillies first memoir "Happens Every Day: An All-Too-True Story." Gillies husband left her for another women. She moves herself and her two young songs back to her parents house in New York City and tries to rebuild her life. The story was a bit choppy, but overall, I liked it. I liked Gillies message to people going through a divorce to try and make it as amicable as possible and try This is a netgalley book and the actual release date is August 2011. A Year and Six Seconds is the continuation of Gillies first memoir "Happens Every Day: An All-Too-True Story." Gillies husband left her for another women. She moves herself and her two young songs back to her parents house in New York City and tries to rebuild her life. Isabel Gillies, a lifelong New Yorker and actress for many years, is the New York Times best selling author of Happens Every Day, A Year and Six Seconds, and Starry Night (FSG), a young adult novel about first love. Her work has been published in Vogue, The New York Times, Real Simple, Cosmopolitan and Saveur. She lives in Manhattan with her husband, kids, and Maude the dog.